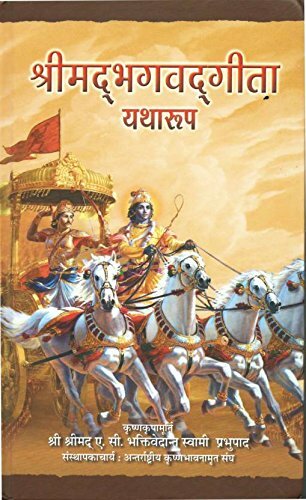 This Hindi Version of the Bhagavad Gita has been translated by AC Bhaktivedanta Swami Prabhupada, a well known sanskrit scholar, spiritual leader and the founder of the International Society for Krishna Consciousness (ISKCON). In the Bhagavad Gita, Lord Krishna has preached from Arjuna. 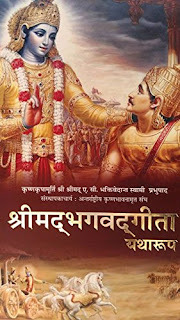 Considered as the crux of all vedantic thought, Krishna urging Arjuna to do his duty and not shy away for the battle he faces, simply because the opposing army consists of cousins, uncles, gurus and other close relatives, lays emphasis on the theory of karma where the question of birth, death and rebirth are also debated. Consisting of eighteen chapters, all the 700 verses of the book have been translated in simple language that can be understood by any person who understands elementary Hindi. For authenticity, the original sanskrit verses have also been included in this edition. Meaning of the sanskrit words, has been rendered in as elaborate a form as possible to make it as close as possible to the original meanings of the language. 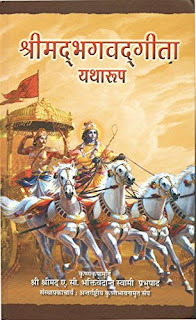 The book also is Illustrated with some paintings of select scenes picked out of Mahabharata, the epic of which the Bhagavad Gita is just one Part. Published in both Hindi And English, the Deluxe Edition comes in hardcover and has 600 pages in it.